Alexander Pope was the only child of a London linen merchant and his wife, recent converts to the Roman Catholic faith. He was barred from public schools because of his religion, and attended secret Catholic school, but was largely self-educated. He learned Latin, Greek, Italian, and French, and wrote his earliest surviving work, Ode to Solitude, at age 12. That same year he began having symptoms of the debilitating bone disorder that would stunt his growth and cause him much pain and suffering for the rest of his life. He was a central figure in the Neoclassical movement of the early 18th century, known for perfecting the rhymed heroic couplet form and turning it to satiric and philosophical purposes, and his works had a profound influence on others. He was the first full-time professional English writer, supporting himself largely on subscription fees for his popular translations of Homer and his edition of the works of William Shakespeare. He died at age 56 of "this long disease, my life." 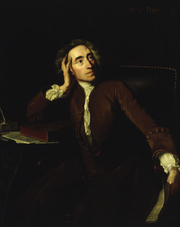 Alexander Pope's book The Iliad was available from LibraryThing Early Reviewers. Alexander Pope is currently considered a "single author." If one or more works are by a distinct, homonymous authors, go ahead and split the author. Alexander Pope is composed of 6 names. You can examine and separate out names.